As its official launch date draws near, we finally got a clearer picture of what the next generation NVIDIA GeForce GTX 980 Maxwell graphics card will be. Recently, the GeForce GTX 980 and GTX 970 specifications, features and even some of its real photos have been revealed, or rather leaked. According to source, the GeForce GTX 980 sports 2048 CUDA cores and 16 SMM (Streaming Multiprocessors Maxwell). Check out the rest of its specifications, and photos below. UPDATE: Made some changes with the specs based on the latest news update. The upcoming next generation NVIDIA GeForce GTX 980 features 2048 CUDA Cores, 16 SMM and is based on the GM204 architecture. It replaces the GK104 and is not only more powerful, but more power efficient as well. The GM204 features 5.2 billion transistors, 128 TMUs, and 64 ROPs. Aside from having 2048 cores, it also sports 4GB GDDR5 memory running on a 256-bit memory interface, with a bandwidth speed of 224 GB/s. Its Core clock speed is reported confirmed to be 1000MHz 1126MHz, with a boost clock speed of 1127MHz 1216MHz. However this information is not yet confirmed. But it’s believed to be more or less close to the real deal. It has a Floating Point Performance (Single Precision) of 4.6 TFLOPs, a Pixel Fillrate of 72.1 GP/s and a Texture Fillrate of 144 GT/s. The GeForce GTX 980 draws its power from two 6-pin power connector and has a Thermal Design Power or TDP of 175W 165W. Although the GM204 is more power efficient and faster, both the GM204 and GK104 are based on a 28nm fab processes. Looking at the GeForce GTX 980, it now features a backplate support and a reference cooler design similar to the GTX Titan Z. Looking at the reference PCB below, you can also see that there are only 8 memory chips, fewer compared to the GTX 780 Ti which has 12 memory chips. On the rear output ports of the GeForce GTX 980, the reference design is built with 1x DVI port, 1x HDMI 2.0 port and 3x DisplayPort. Clearly NVIDIA is promoting or encouraging people to use the much better DisplayPort, instead of the older DVI port. Since the GTX 980 features 3x DisplayPort, this could mean that it’s capable of G-Sync Surround. Also notice that the rear output shield is similar to the design of the GTX Titan Z, featuring triangle vent cut-outs. Remember, what we are seeing here is just the reference design. I’m sure major AIB’s will have their customized PCB and will probably unleash something definitely faster / powerful than the reference one. UPDATE: Aside from the physical specifications, the NVIDIA Maxwell GM204 also has other features like Dynamic Super Resolution, Third Generation Delta Color Compression and Multi-Pixel Programmable Sampling. The Dynamic Super Resolution is a new up-scaling technology that somehow offers 4K quality on a 1080p display. Hmmm I wonder how would that look like. The Third Generation Delta Color Compression on the other hand is a technology that helps increase the memory efficiency, and finally the Multi-Pixel Programmable Sampling improves the sample randomization and reduces the quantization artifacts. On a related story, some specifications of the NVIDIA GeForce GTX 970 have been revealed as well. The GeForce GTX 970 features GM204-200 core silicon and will feature 1664 CUDA cores, that’s 384 cores less than the GTX 980. Its core clock speed is reported to be 1051MHz with a boost clock speed of 1178MHz. However the clock speeds are not yet confirmed or final. Final product may have different clock speeds. It will also feature 4GB of GDDR5 memory running on a 256-bit memory interface. Its bandwidth speed is also 224GB/s and it will draw power from two 6-pin power connector, just like the GTX 980. However it has a much lower Thermal Design Power of 148W TDP only. 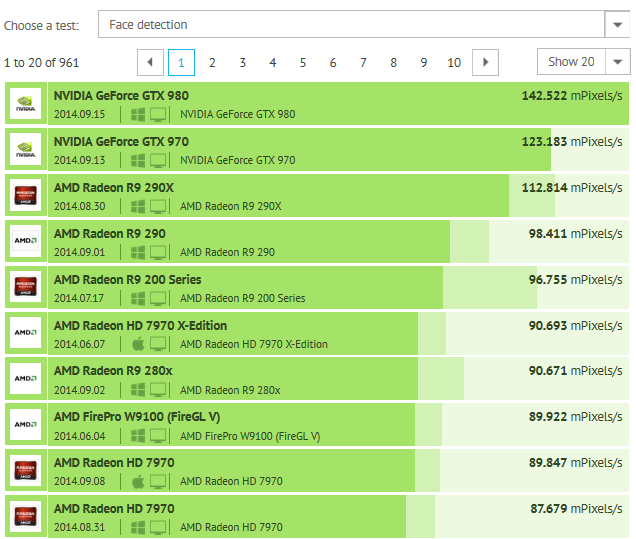 Here’s a benchmark of the said GTX 980 and GTX 970. The Unknown-2 is the GTX 980, while the Unknown-1 is the GTX 970. Both cards show that they are faster than their predecessors. 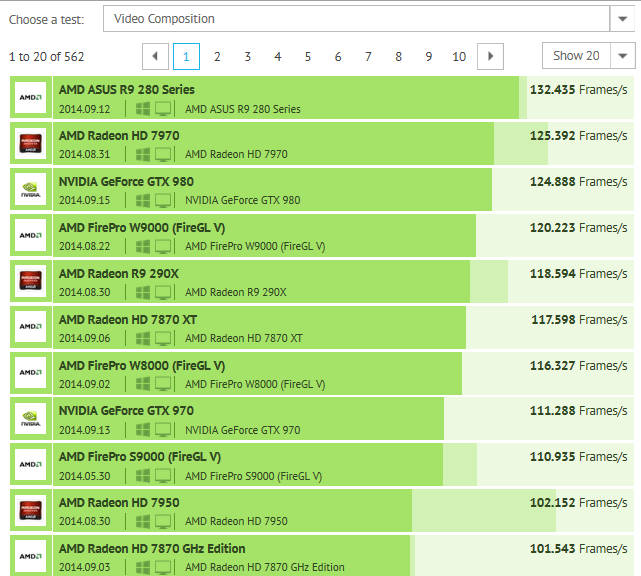 However, these are not official benchmarks yet and let’s just wait for real reviews to come out. 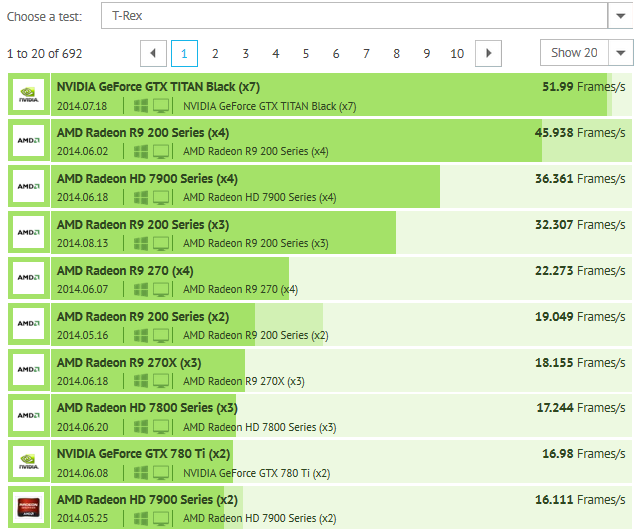 Meanwhile you can see more leak benchmarks here. 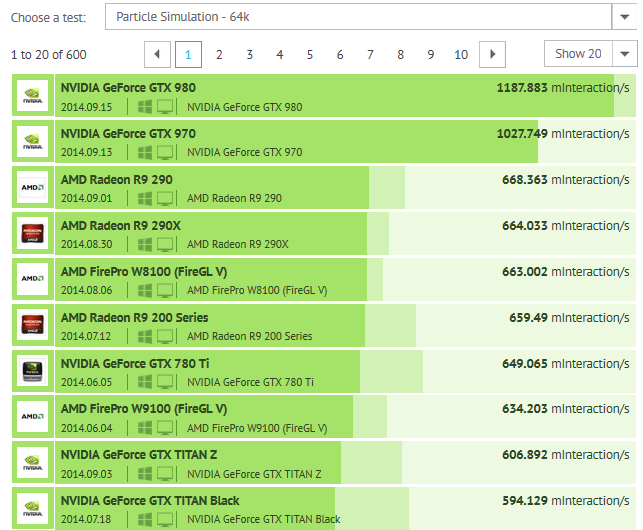 Below are benchmarks results from CompuBench that uses OpenCL to gauge the performance of a graphics card. Both the NVIDIA GeForce GTX 980 and GTX 970 are expected to be officially launched this coming September 19, 2014, during NVIDIA’s Gaming event. However there are reports that actual availability will be towards the end of the month or early September. But I doubt that since there are retailers who accidentally leaked a GTX 970, while some claim that it will be available a number of days after it’s official announcement. Meanwhile, the GeForce GTX 960, successor of the popular GTX 760, will be officially launched sometime on October. There are no reports yet regarding a certain GTX 980 Ti. Prices for the upcoming GeForce GTX 980 and GTX 970 have been revealed as well. The GTX 980 is expected to be priced at $599 for the reference design. That’s somewhat near the price of the GTX 780 Ti already. Obviously, non-reference GTX 980 will be priced higher than $600 USD. Meanwhile, the GTX 970 is expected to be priced starting $399. UPDATE: According to latest reports, NVIDIA will set the price of the GTX 970 down to $299 USD. However the GTX 980 would remain around $549 USD. Expect that non-reference cards will be priced higher at around $20 to $50 more.